I am thinking of buying the Mammut Smart Alpine device but I would like to hear some reviews on it first. I will use it mainly for Trad in which case I would like to know if this device belays nicely from above, and can it be used in guide mode? 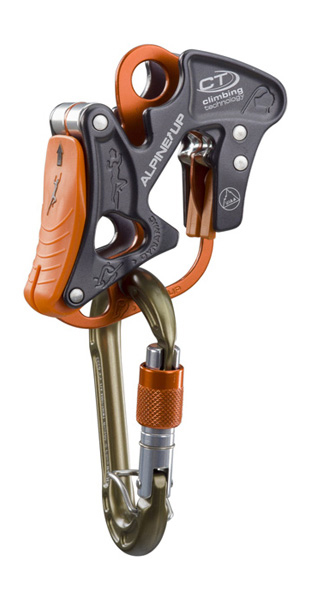 If so, does it work well in guide mode when belaying as lead climber at the top of a pitch and does it auto-lock well? If it auto-locks (from above), can you release it easily and practically when the climber needs some slack? I'd appreciate some helpful comments, Thanks! I bought a Mammut Smart (single rope version) for my partner as a sport belay device. I was so impressed with the way the device worked that I then bought the twin rope version for trad climbing. Unfortunately the twin rope version did not work as well as expected, specifically when bringing up a second. Here are some of the draw backs. I found that if you have the device connected to the stance, and not into your belay loop on your harness, and the seconder takes a fall, I found it almost impossible to release the lock. The device is large compared to the Petzel Reverso or BD Guide. On the plus side the Mammut Smart does lock off when abseiling eliminating the need to a prusik as backup. In summary, I would not recommend the twin rope version, but HIGHLY recommend the single rope version. I use a Mammut Smart Alpine device for trad climbing and I highly recommend it. According to this video, you don't have to tie the brake strand to a munter hitch when lowering a climber in guide mode (the manual for an ATC Guide says you have to do it for an ATC Guide). I haven't had to lower a climber so I can't comment on how well it works in practice. The manual for the Smart suggests extending the device with a sling and using a prusik on the brake strand when rappelling (like you will do with an ATC) but I find rappelling with this setup hard - you have to unlock the prusik with one hand and the Smart with the other and then you don't have another hand to control the rope. If I rappel with the Smart connected directly to the belay loop without a prusik it works pretty well and I think the autolocking will work as reliably as a prusik on an ATC anyway. Bought the smart alpine to add a bit of safety to trad falls last year because I am not confident it will be easy to catch a large fall on 8mm mammut twins with the BD ATC Guide. Experience so far (No big falls or having to release a second yet, just 30 or so trad pitches with my 8mm's). Falling: I found it actually doesn't lock too well with short, slow, small falls and I still want to test it a bit with proper falls before I can really say. Belaying: Bit more clumsy than BD to pay out and manage rope, locks up a bit and needs some getting used to. Assisted break takes some pressure of the belay though. Guide mode: Much more of a struggle than the BD. Friction, size. Abseiling: Its a struggle to get the rope to feed in nicely, typically tangles and comes in from the side and once nearly got it jammed in the middle of fountains ledge. Particularly hard to manage the device if you extend it with a sling as it starts twisting and you run out of hands. I see the other commenters say they don't use a prussic with it, I don't actually trust it enough. Summary, I don't trust it and clearly, I should go out and test it a bit more. But If it stops a catastrophic trad fall from slipping through my fingers, I feel the effort would be worth it. And it was cheap... Right now we use it for lead belaying and take a ATC guide along for guide mode and abseils. What device would be better ? There is nothing more beautiful than a well dressed alpine butterfly. Agree with Guardian on most points. 2. It does lock when you take falls on the device, I have done it enough to trust its locking capabilities. Personally, I am glad I have this device because I trust its locking capabilities when leading and helps me feel more comfortable with falling on thin half ropes, but it isn't a great device for many other reasons ... I use it only for belaying the leader and in that scenario, it works very well. And the leader will carry a reverso to use in guide mode. Thank you for all the feedback everyone. It is quite helpful! I noticed that most people struggle to pay out slack the first time they use a Smart, there is a little trick to it that makes it easier: Start with brake hand on brake strand (probably 10 cm away from the device) and other hand on the climber's side of the rope. First take as much slack as you can in the brake strand by moving your brake hand down the rope then move your brake hand up (gripping the rope) and unlock the device by pushing out on the handle and use your other hand to pull the slack through. You will now be in the starting possition again and can repeat the procedure. I have to admit that the Smart is much more sensitive to twisted ropes (when using double ropes) than an ATC when belaying. Sometimes you have to keep one finger of your brake hand between the two ropes to feed them properly into the device which is a real pain. When looking for the Smart's manual today I found out that it is possible to rig the device upside down when abseiling, which makes it not auto-lock, so then it works pretty much like an ATC. I tested that and it seems to do the trick. I also tested giving slack in guide mode on a tight rope and it feels pretty much the same as an ATC in that it unlocks really suddenly; contrary to my previous post I don't think I'll try to lower someone in guide mode with a Smart without using a munter or something on the brake hand. My philosophy is if you're being belayed in guide mode then you better know how to prusik up the rope if you fall because I will not be too keen to try and give slack in this scenario. If I think the second may have to be lowered after a fall I will rather belay from my harness. Thank you francoisP this is the best solution to the abseiling problem with the Mammut Smart. "When looking for the Smart's manual today I found out that it is possible to rig the device upside down when abseiling, which makes it not auto-lock, so then it works pretty much like an ATC. I tested that and it seems to do the trick." Standard/Important to rig it with a prussik while absailing with it too. The CT Alpine Up apparently autolocks both on belay and abseil. Dunno if it is easier to use though. I recently got a DMM Pivot and had to use it to lower while in guide mode for the first time and it works really well, with a very gradual release of the rope. Much less abrupt than the BD Guide/Petzl Reverso IMO. Intrigued and tempted by the CT Alpine up. It's a shame it's not available locally. My climbing partner had an Alpine Up. He hated it. I think he's selling it cheap. I hated it more: felt like it jammed when you didn't want it to, but didn't catch when you wanted it to. Bulky, with no benefits. Wasn't willing to part ways with even $0.01 for it. If you're interested I can put you in touch with him (except he's moved to France). IMHO the only improvements over the ATC Guide is the Tre (and it's derivative, the Zap-o-Mat). Have you tried a DMM Pivot? As nice as the Guide and much nicer to release rope under load when in guide mode. I could not find much on the Tre beside this link with pretty good reviews (http://www.rockclimbing.com/gear/Essent ... _1302.html). The reviews are pretty good for this device as a double rope belay device with assisted breaking mechanism. It is however not available in South Africa from my little bit of googling. I am skeptical of the Alpine Up just because there are so many moving parts, I can't say its good or bad since I never used one. The reason I like the Mammut smart alpine is that it is one solid piece, no moving parts. Drop it in the sand and there is nothing that can get jammed or malfunction, its light, and has the desired assisted breaking on double ropes (for trad diameter). Note the Mammut smart (excluding alpine) is of thicker diameter 8-10.5mm and not ideal for Trad. Ultimately for the purpose of trad multi-pitching, the Mammut smart Alpine is the only affordable and available device I could get my hands on that has the assisted breaking mechanism I was looking for when belaying a heavier person on a trad climb. Hope this was useful. Safe and happy climbing. The Tre is (apparently) the greatest belay device that only a handful of people have ever seen, let alone actually used. It's no longer in production, nor is anything similar being made. Despite the endless praises heaped upon it, no manufacturer seems willing to produce it but they rather stick with their (apparently) inferior, difficult to use products for some reason. Weird, it's like they don't want happy customers. nor is anything similar being made. no manufacturer seems willing to produce it. As far as I can make out, Edelrid bought the copyright and produced the Zap-o-Mat as a single rope version. I have both - the work the same, they feel the same. But the Zap-o-Mat never really took off. My bucket-list includes using KickStarter to resuscitate the Tre - I reckon I can get pre-funding for a production run of ~5,000 units (unless someone gets there first). In the mean time ... the I'd stick with the Guide (or a Bugette for really skinny ropes). The Smart Alpine is nice, but it doesn't offer enough functionality for the added bulk - IMHO. So Friday I got to try out the Edelrid MegaJul device from some European that had one. It definitely has an "assisted breaking mechanism" which I like but felt like even with a 10mm sport-rope there was significantly more rope creep compared to the Mammut smart. The principle works exactly the same. Nic. The mythical TRE is like a unicorn. Just because you don't see one everyday doesn't mean they're not out there being magical. The TRE is like the golden sword that gets unlocked for level 60 climbers after they've beaten the big boss at the end of the game. The CT Alpine UP seems to take some getting used to but definitely sits well in the category of auto-lock type devices - not so sure that I need that when it comes to trad, as most often the belay is more "loose" and distant when it comes to Trad - as another said- in Trad the catch is often not so sharp and instantaneous. Still maybe if you are pushing the limits then that is the type of device you need... As I said it works well in THAT application. Which brings me to Nic's point - the DMM Pivot is an excellent Trad belay device and I would buy it before any other. It does normal belay well, it does guide mode well - yes you can gently release a locked off second and it abseils well. For me it is the bees knees. It's great for ab-ing with a prusik safety below the device if you thread it the "wrong way" around, with the anchor side of the rope coming in over the v-slots and exiting over the pivot. The balance between friction and control is just right. Not good for anything? If you have one collecting dust, I'll drive down to Cape Town to help you clear out the space! This is how you find the Masons, claim to have a Tre for sale.